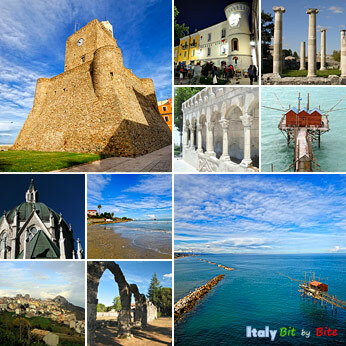 Shaped like a wedge, the region of Molise is located between the Apennines and the sea. 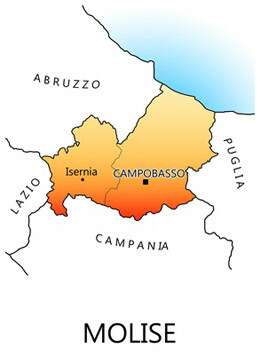 It is the second smallest in size and population of the 20 Italian regions and its the territory is mainly mountainous. Under the Normans the region was known as "Comitatus Molisii", which may have come from the name of one of the leading families. Agnone, home of the Fonderia pontificia Marinelli, the oldest bell factory in the world. The Tremiti islands (even if they are part of the Puglia region) are only a ferry away. Photo credits (top to bottom): Molise collage: Ielsi by Mario Gravina, Termoli seascape, Termoli beach and castello svevo by antothefly, Pietrabbondante by diffendale, Isernia fontana by fedeabmo, Termoli trabucchi by gengish, Sepino by Roger Ulrich, Rocchetta al Volturno (San Vincenzo) by gengish.